The Library of Congress houses more knowledge than any other institution in the world. But is knowledge really knowledge if nobody can read it? 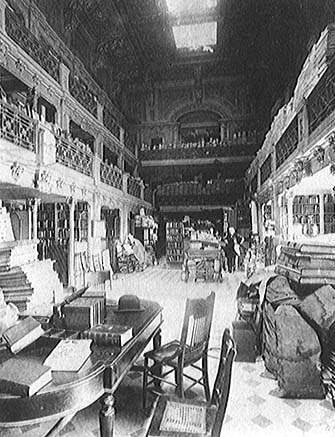 The Library of Congress, circa 1890. Apparently, even then it had trouble cataloging all of its content. This week James Billington, the Librarian of Congress since 1987, announced that he plans to retire on January 1. The story behind Billington’s resignation, as often happens when someone is on the job for so long, is complicated. In recent years Billington has come under fire from critics for several aspects of his leadership. The biggest complaint, however, is this: the Library suffers from a serious technology gap. According to the news report about Billington’s resignation, “just a small fraction of [the Library’s] 24 million books are available to read online.” The article also hints at a cataloging problem: millions of printed pieces – some dating to the 1980s – are piled in warehouses, waiting to be shelved. It’s a problem that might be alleviated with the right application of technology. Billington and his defenders argue that he’s started the Library on the path toward modernization. Of course he has: he’s been on the job since 1987. So even if the Library is using 1990s technology he can take credit for it. But when all’s said and done, it’s clear that the Library is late to the technology game. Like the Library of Congress, we technical communicators are in the business of making knowledge available to people who need it. Over the past few decades we’ve embraced technology to help us create better knowledge, create it faster, and deliver it to our readers in a host of new formats. But our profession suffers from a technology gap too. Many of our readers still can’t find knowledge that they need, or still don’t have the means or the equipment to display it. So have we done enough? Have we embraced technology, but not embraced it fast enough? Or could it be that our employers, many of them trapped in an outmoded print-and-PDF mindset, haven’t felt the urgency to invest in technology that would shrink the gap? I think the problem is a little bit with us and a lot more with the people who sign our paychecks. Yet how can we blame them if we’ve never been able to make the business case for investing in new technology? What do you think? How big is the technology gap in technical communication? What can we do to close the gap, so that we can fulfill our mission of delivering knowledge to people who need it? This entry was posted in Media and technology, Technical communication, Value and tagged business case, Library of Congress, Technical communication, technology, value on June 12, 2015 by Larry Kunz.